This Florence Nosworthy illustration was created for the September 1926 edition of Hearth and Home Magazine. These two children, puppy in hand, wait at the train station for arrival of the next train, and appear to be heading home from their summer travels. This painting is a great example of Ms. Nosworthy's talent as an illustrator, and is typical of the type of illustrations for which she is known. Florence Pearl England Nosworthy was born in 1872 in Milwaukee, Wisconsin. She studied with Edmund Tarbell and Frank W. Benson at the Boston Museum School of Fine art, as well as with Kenyon Cox and George Barse at the Art Students League in New York. Ms. Nosworthy was a member of the Copley Society; Southern FA. In 1934, she exhibited her work at the Salons of America. Included among her long list of illustrations is: Great Musicians, Miss Theodora, Bunny Brown Books by Laura Lee Hope, Tommy Tinkers Books, Betty of Wye, and Land of Play (1911). 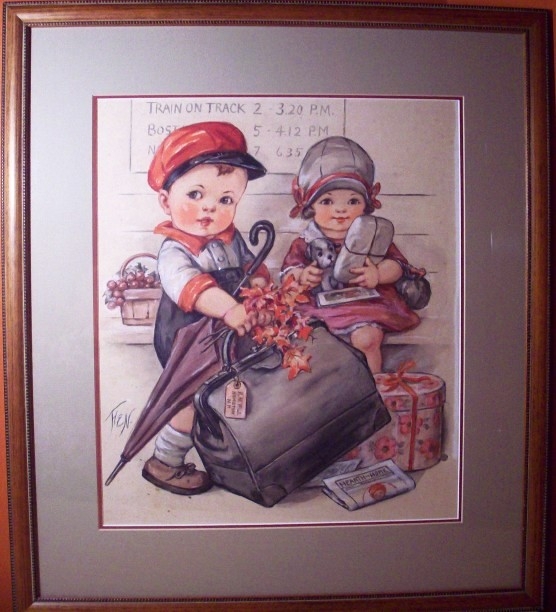 In addition, she illustrated many covers for women's and children's magazines, as well as calendars and postcards. Florence Nosworthy passed away in 1936 in Hampton, CT.